If these colors don't get you excited for spring, I'm not sure anything will. I mean, that cobalt blue alone is worth an abnormal about of giddiness. 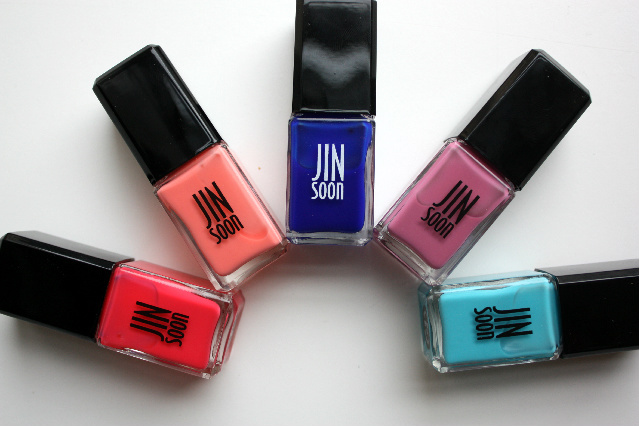 I have been intrigued by Jin Soon Choi's new line ever since it launched last year - with bloggers and beauty editors alike raving about the staying power, texture and color range of the polishes. Known for her 2 NYC nail spas and presence backstage at fashion week for years prior, it was only a matter of time before she launched her own line (and finally answered all of our prayers). So after hearing all the positive reviews and praises being sung, I did what any self respecting beauty junkie would do and bought the entire spring collection - all 5 shades and painted each one of my fingers a different color in celebration. Oh, and then snapped a pic so I could show all of you - because if a blogger tries something and doesn't share it, did it ever really exist???? Let me be the first to tell you, that yes, these polishes live up to and exceed the hype. The texture is phenomenal - going on almost like a jelly finish polish, but once the second coat is added the payoff is vibrant and opaque. I think you should also know that the above pic does not include a top coat. Say wha??? I know, they are THAT shiny. I ended up leaving my multi colored masterpiece on until my next manicure which was 5 days away and there was nary a chip in sight. I foresee a Jin Soon Choi nail polish takeover happening in my beauty closet very soon - and can you blame me? Purchase the entire collection here. Colors in top photo from left to right: Tea Rose, Coral Peony, Blue Iris, French Lilac and Poppy Blue. THAT cobalt!! 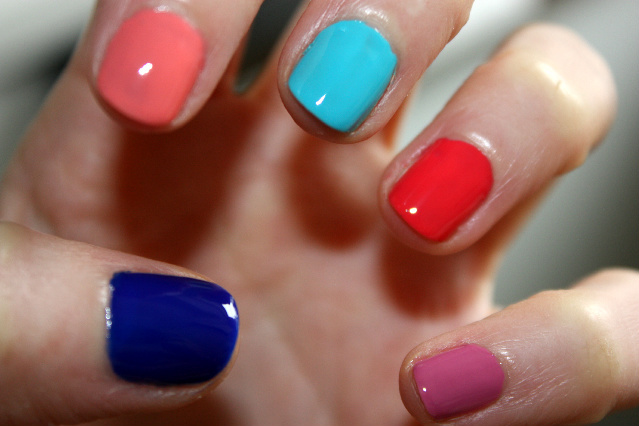 Get on my nails!